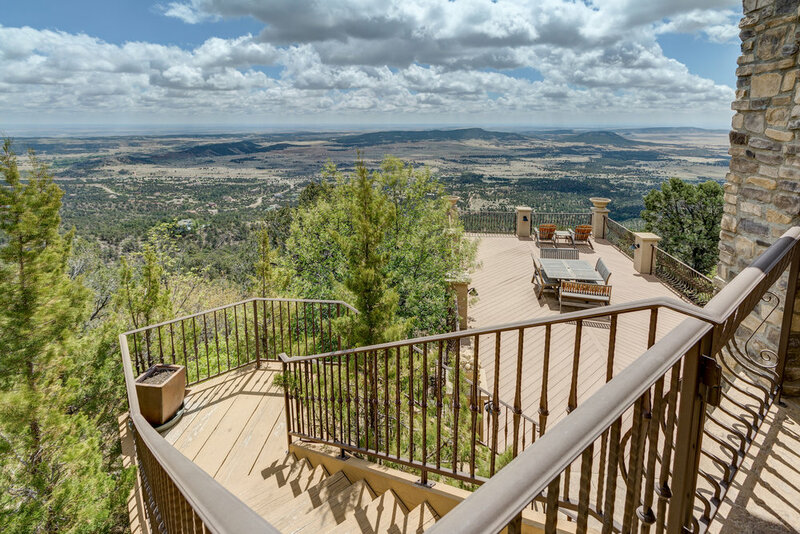 Perched on a 35-acre ridge lot, this spectacular custom home boasts forever views all the way to the Sangre De Cristo mountains. 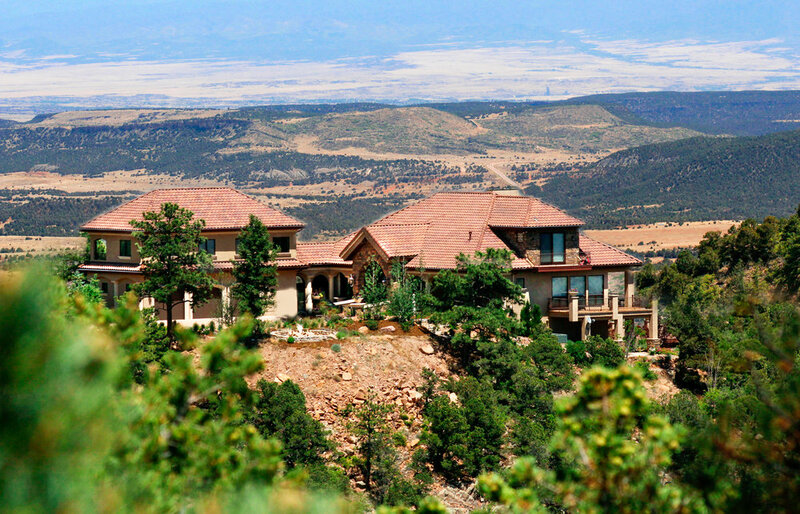 Located in the gated community known as “The Highlands of Turkey Canon Ranch,” the home is a 20-minute drive south of Colorado Springs. Special interior features include barrel and peaked ceilings, hand-textured walls, custom chandeliers, media room, wine closet and two wet bars. 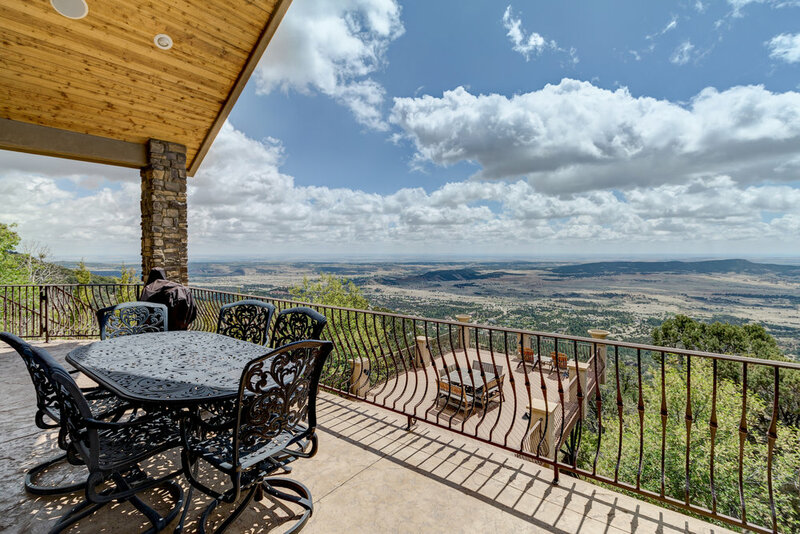 The home also boasts approximately 3,750 square feet of premier outdoor living space. 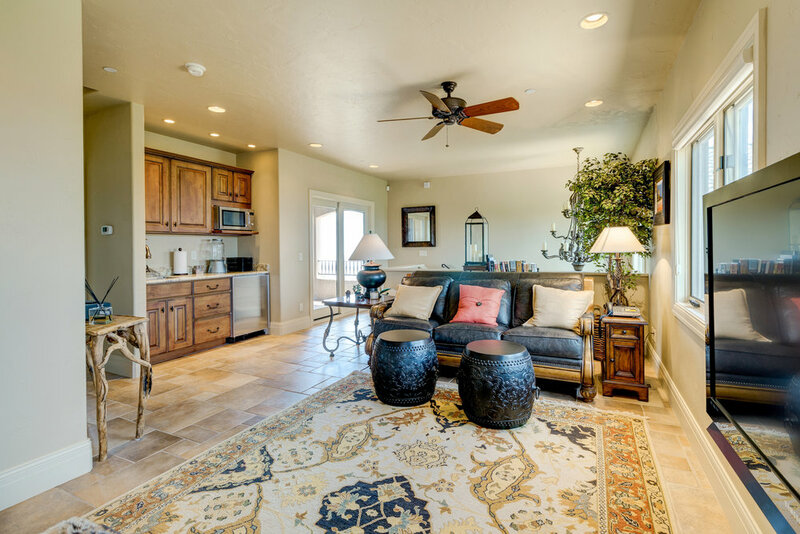 Located over the garage, there is a 2-bedroom guest suite with sitting room, wet bar and a private entrance. Central air, Two furnaces for main house with humidifiers, Separate furnace for 2-bedroom suite. 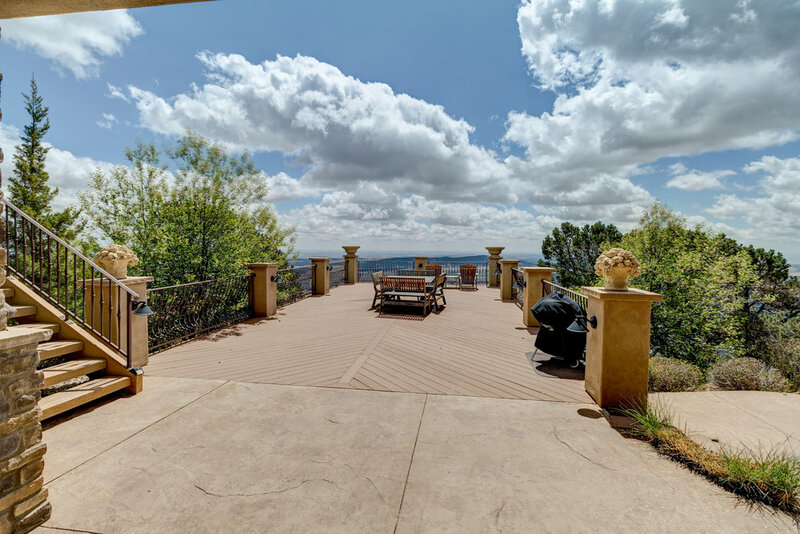 Approximately 3,750 square feet of decking and/or patio to include an 81’ X 10’ deck off the main level, a 74’ X 30’ patio off the lower level and a cantilevered 35’ X 20’ Trex deck with built-in seating and amazing views. 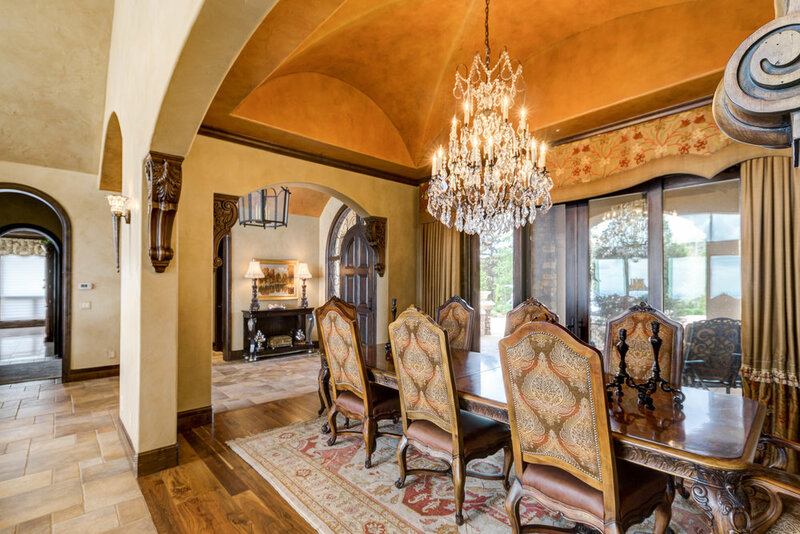 On the left, two arched entrances adorned by carved corbels invite you into the formal dining room. 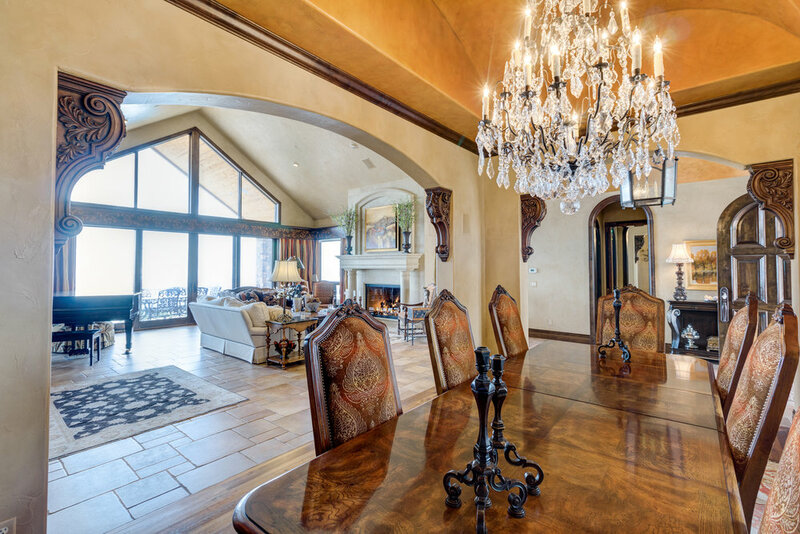 Located to the left of the foyer, the dining room has walnut floors, an impressive double barrel ceiling with crystal chandelier, custom drapes and sliding French doors to the covered front porch. 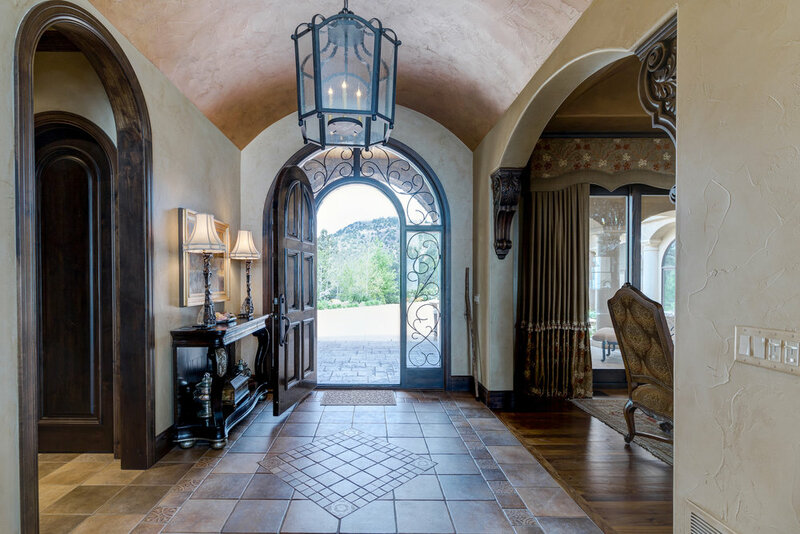 On the right, another arched entrance leads to a coat closet with arched door and the powder room. The powder room, which also has an arched entry door, offers tiled floors, a furniture vanity and chandelier. A faux-painted vestibule with an arched door leads to the lovely master suite. 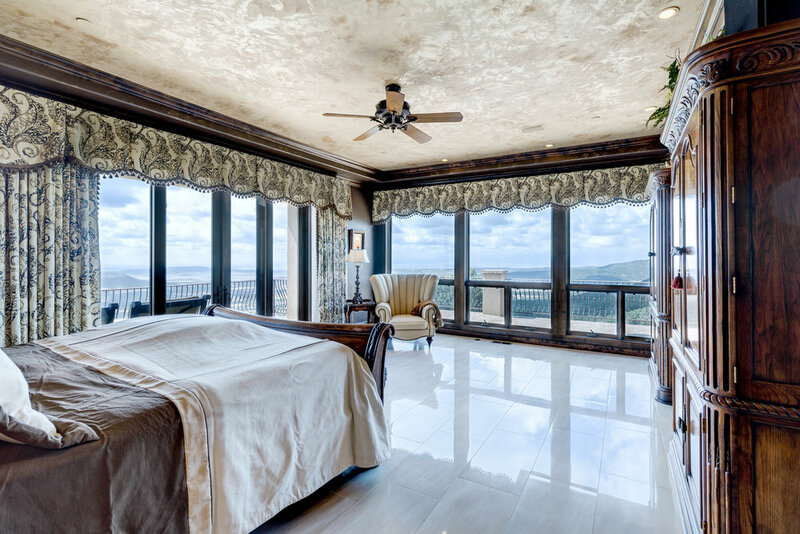 The master bedroom is has lovely tiled floors and features a coved faux-painted ceiling with ceiling fan and a big French sliding door to the covered rear deck. The master bath has raised vanities with under mount sinks, heated tiled floors and an oversized tiled shower for two with two showerheads. 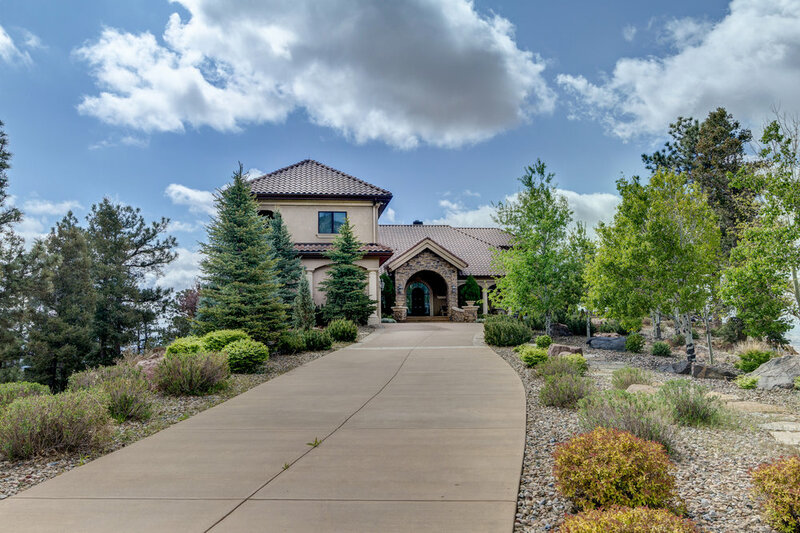 The stunning great room has a soaring peaked ceiling, tiled floors, a handsome stone fireplace with gas logs and large French sliders that open to the rear patio that measures 81’ X 10’. This patio, which is partially covered and expands the rear of the home, has a built-in outdoor gas grill. Opening to the great room, the gourmet kitchen features a large center isle with under mount vegetable sink, counter seating and lit bookcase with glass paned cabinet doors. 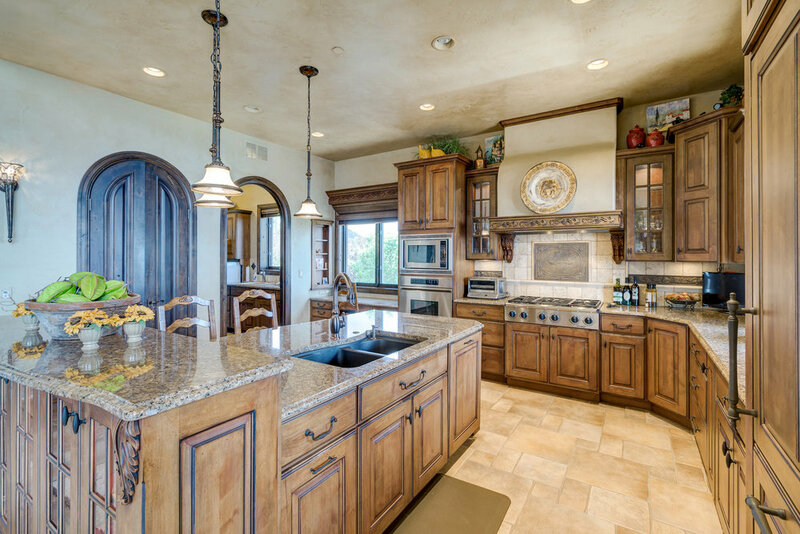 This well-designed kitchen also offers a large second under mount sink, a built-in desk with slab granite top, alder cabinetry with slab granite counters and a walk-in pantry with arched double-doors. Kitchen appliances include a gas range with six burners and custom overhead flue; a stainless oven and microwave; and a Sub Zero refrigerator/ freezer with matching alder panels. Next to the kitchen, the laundry room has tiled floors, sink, a closet for your audio equipment and a pantry. A breezeway leads to the 2-bedroom guest suite located over the garage. Very spacious, the breezeway has a cozy sitting area, tiled floors and French doors that access the front porch. From the breezeway, a tiled staircase with chandelier leads to the suite. The sitting room, which features a wet bar, tiled floors and a ceiling fan, opens to a covered concrete deck that has a built-in gas grill. Guest bedroom with ceiling fan and hardwood floors. 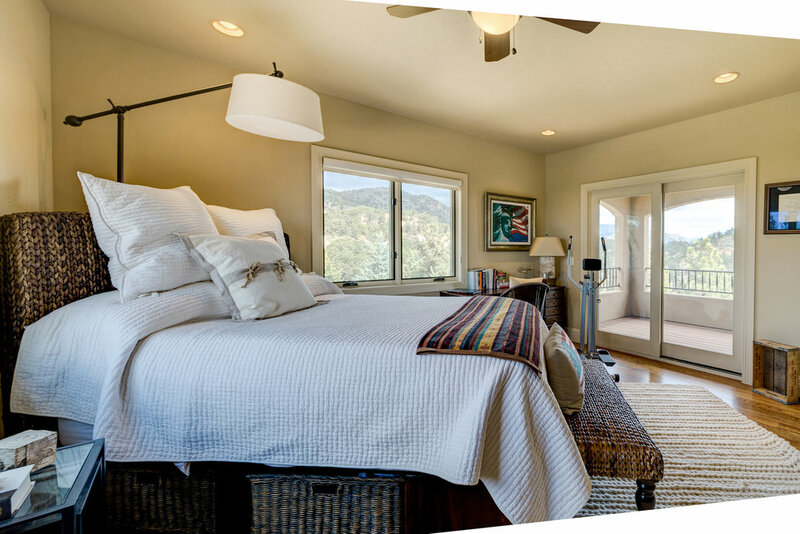 Guest bedroom with ceiling fan, hardwood floors and its own covered deck with Trex flooring. A walnut staircase with tiled risers, wrought iron railing and an impressive stone accent wall provides a grand entrance to this upper level. On this level there is a lovely office/loft with built-in bookcases, ceiling fan and walnut floors. There are two smaller rooms off the office/loft with endless uses. One could even be converted into another bathroom. 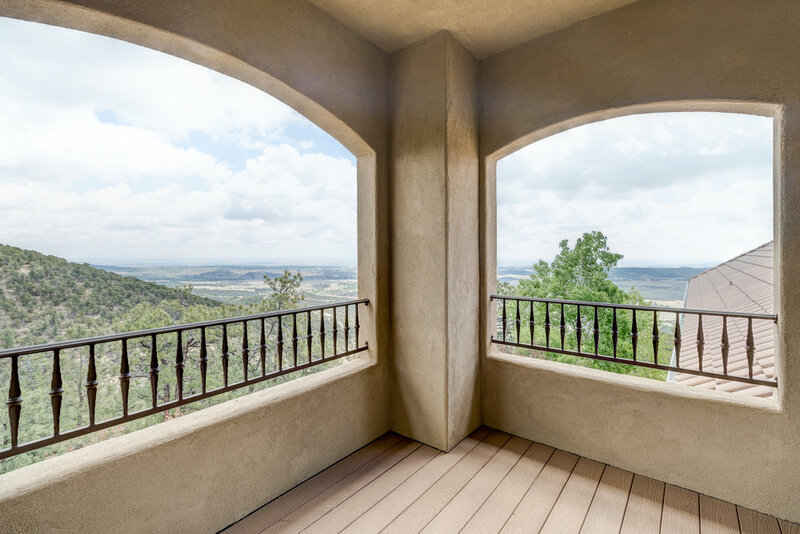 The loft opens to a private balcony where views of the Spanish Peaks await. 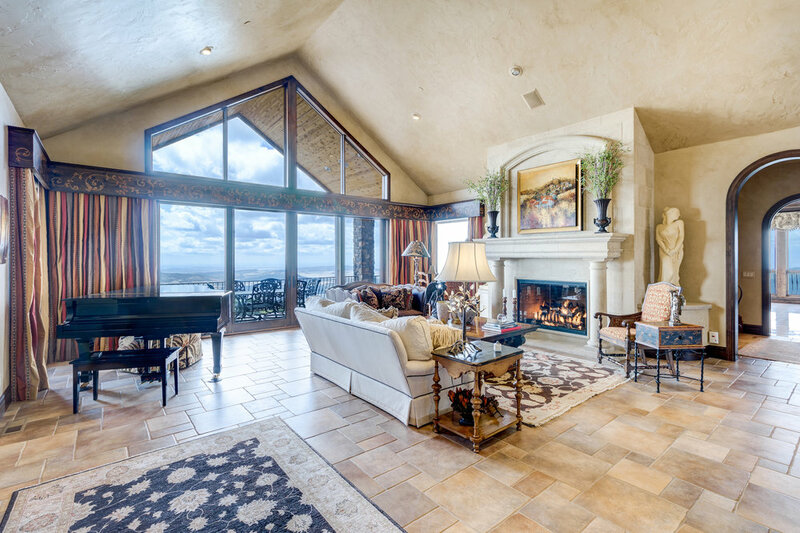 The focal point of the lower level is the fabulous rec room with tiled floors. 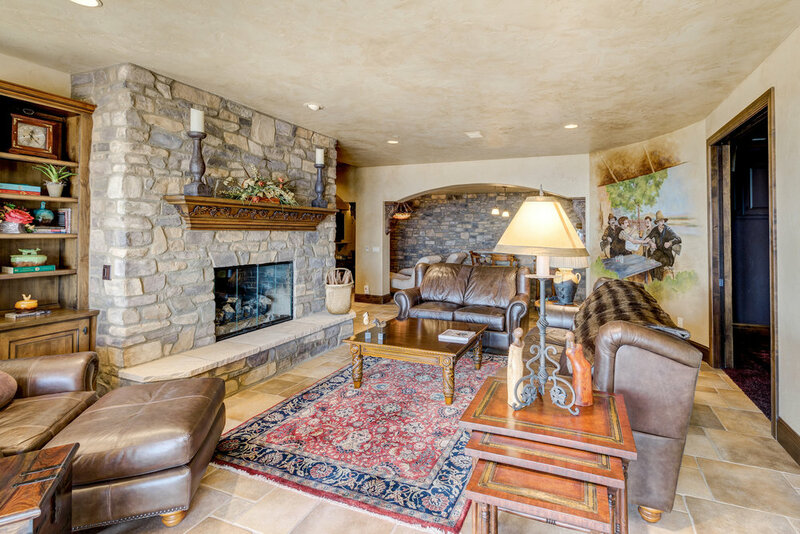 The rec room consists of two areas: a wet bar/ TV area with stone accent wall and a sitting area with fireplace. The wet bar/TV area is designated by two large arched entrances. The deluxe wet bar has a stone surface and alder cabinetry with slab granite countertops. The TV area adjoins the wet bar and comes complete with a flat screen TV. 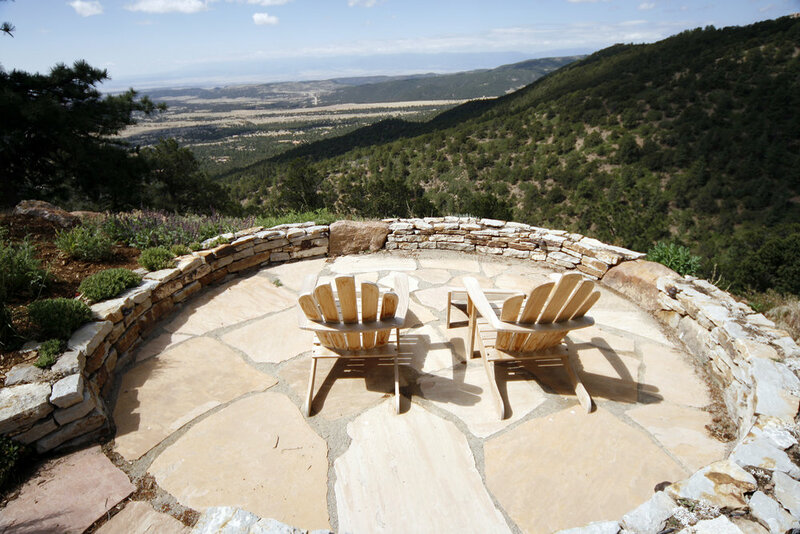 The sitting area has a delightful mural of the wine country and a floor to ceiling stone fireplace with gas logs. The fireplace is flanked by built-in bookcases. Exercise room (or 4th bedroom) with mirrored wall, a walkout to lower level patio and direct access to the adjoining bath. Spacious tiled bath with steam shower with two shower heads. Fabulous wine closet with wrought-iron door, chandelier and alder cabinets with wood countertops. 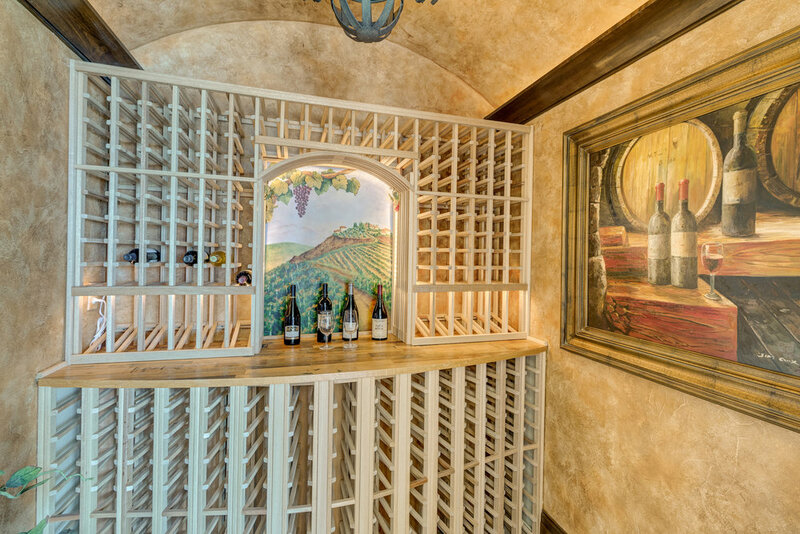 The wine room’s ceiling is barreled with crown molding that has lighting behind. The room’s finishing touches are a hand painted Napa scene and one-half of a wine barrel that is “built-in.” Amazing details! Pocket doors open to the theater room with top of the line audio/visual equipment to include an IDP Sound System with 7 speakers. The theater also features eggplant walls, special lighting and a tiered floor. Mechanical room with furnaces, humidifiers and hot water heaters.